One of the primary struggles of marketers is understanding what is important. Taking the data given to them and making it into something meaningful. This is why so many focus on secondary metrics, and obsess unnecessarily over things that have very little to do with their success. It’s why there is such a need for a way to measure actual value of Facebook marketing efforts. Many have tried — though unsuccessfully — to measure the value of a page like. While I do believe you can measure this number for your own page, it certainly isn’t something that you can apply globally. The value of your fan is not equal to the value of mine, as the source and context are important. 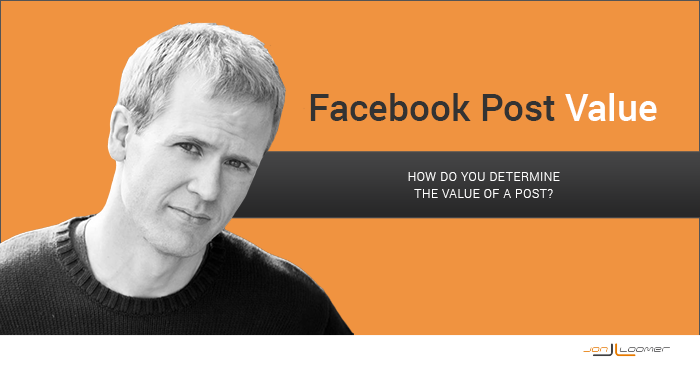 The same goes for determining the value of an individual Facebook post. I can assign a dollar value based on what particular actions are worth to me, but what these actions are worth to another brand are irrelevant. Still, this is an exercise that I’ve become increasingly curious about. I promote my blog posts at an average rate of $.16 per website click. Traffic is valuable to me, so it’s a routine that I repeat every time I’ve published a new post (and I will do it again upon publishing this one). As a result, I can determine that a website click from a Facebook post is worth $.16 to me. That then allows me to look at individual organic posts in a whole different light. Forget Reach for a moment. Forget comments, likes and shares. If your objective was to drive website traffic, how many website clicks resulted from your post, and what is that worth to you? Last week, I experimented with a post and I want to share my results. In the end, this is only one post. It’s my post, and as such it is the smallest of sample sizes. But you can participate in a similar exercise to learn the value of your own posts. My hope is that this will help you better focus on the metrics that actually matter and isolate the posts that make the most impact for you. To determine the value of one of my Facebook posts, I needed to track it from beginning to end — or as close to the end of a post’s organic distribution as possible. So I would need to know more than just how many people saw the post or engaged with it. I wanted to know what people did after clicking on it. For the purpose of this experiment, I am focusing on a link post that drives users to my website. While I would eventually promote the post, I delayed promotion for two days in this case so as not to impact my organic results. I wasn’t planning to write a second post last week, but I decided I wanted to run this experiment shortly after my Monday post was published. And since I didn’t catch it from the beginning, the results weren’t going to be complete. So I decided to write a post about something that has been bugging me — a rant in response to those marketers who constantly complain about Facebook. I knew that the post would be popular since it was a controversial topic. This would make for a good test subject since it would bring a decent sample size of traffic without promotion. 1) This will include users who clicked the tagged link outside of Facebook. This happens when someone reads my original post on Facebook and then shares it via email, Twitter or somewhere else. That same link could then be clicked from another social network. I’m okay with this since the original click came from my share. Had I not shared that link, it’s unlikely the user would have seen and clicked it on Twitter. 2) Not all conversions are tracked. What’s nice about Facebook ad reports is that you can see how many people convert (buy or register), even if they leave your website and come back at another time — or even on another day. Those conversions won’t be captured in this experiment. Remember that this is focusing purely on the organic post, so I won’t have access to that data within the ad reports. I need to instead focus on Google Analytics (with help from my URL tagging), but the conversions reported will not include those return visitors. First, it’s important to remember that you need to determine what is valuable to you. I focus on specific actions — particularly those actions that are my campaign objectives. As a result, I do not assign substantive value to reach, comments, post likes or shares. That doesn’t mean that the actions I value are the only ones. It all depends on the goals of your business. For the post in my experiment, the primary two actions I can measure are link clicks and page likes. We know that these things happen from a link share. Note that my blog post is not selling any product. It’s not even pushing registration for anything. But when those users click my link and come to my site, they may convert even though it wasn’t the initial objective. I want to capture these people. Measuring page likes will be an inexact science since Facebook doesn’t report number of page likes that result from a specific organic post (only ads). But I can make a very close guess that won’t significantly impact my results. Also note that since this is an organic post, the only page likes that will result will be from those non-fans who see it after a fan engages with it. I will measure all kinds of conversions — including sales, though I don’t expect sales in this case. The value of these things are unique to me based on what I have spent to acquire these actions in the past. It does not matter what you or anyone else pays for these actions. That would be irrelevant. So I ran reports for all of 2014 to determine the value of a link click, page like and various types of conversions based on what I’ve spent to acquire them. When determining the value of a page like, I only focused on those campaigns where the objective was Page Likes. Ads run with another objective that yielded a handful of page likes were not counted. For link clicks, the objective needed to be Clicks to Website. Additionally, I only focused on the promotion of my own blog posts. For conversions, the objective was Website Conversions and for that specific conversion type. For example, I found the average cost for a registration to my 9 Ways Ebook and Power Editor Webinar. There were also a handful of other conversions that I’m not running ads for — my dimensions infographic and the general newsletter opt-in. As a result, I simply found the average of the ebook and webinar values to assign to “all other” conversions. Using Google Analytics and URL tagging, I am able to isolate the number of link clicks, ebook and webinar registrations that came directly from my organic post before it was promoted. For page likes, we need to make an educated guess. 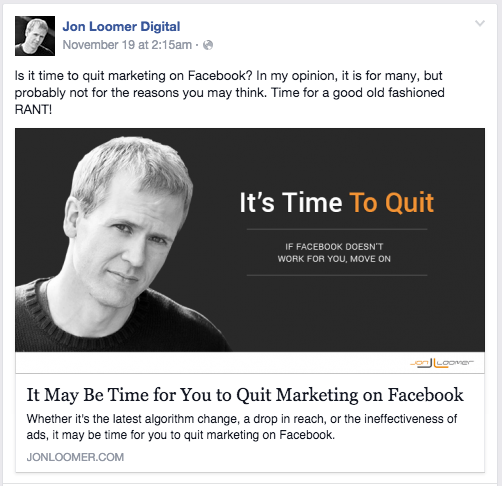 When I later promoted this post, I would receive 59 page likes for 2,452 website clicks. At that rate, I’d receive about 126 page likes when this post was running organically (and really, it very likely generated more than that as an organic post). So the traffic generated from this post is consistent with two of my recent high performers. Something to consider is that this post also likely generated a lot of “mainstream” attention. As a result, they may not be my target audience for products. My more typical traffic is much more likely to result in a sale. It also doesn’t consider my sales funnel. I added 63 people to my email list, but there are also likely hundreds of new people I can retarget with ads since they have now visited my website. Many of my sales result from nurturing, not first-time visitors. Overall, it’s a fun exercise though certainly not perfect. But considering how much I value traffic, it reiterates just how valuable a highly engaged fan base actually is. Without sharing this post organically, I would have needed to spend nearly $1,000 to get similar results. I encourage you to run a similar experiment with your own content. Remember that you should use actions that are valuable to you, and you should research your own data to determine those values. How much are your Facebook posts worth? Let me know in the comments below!